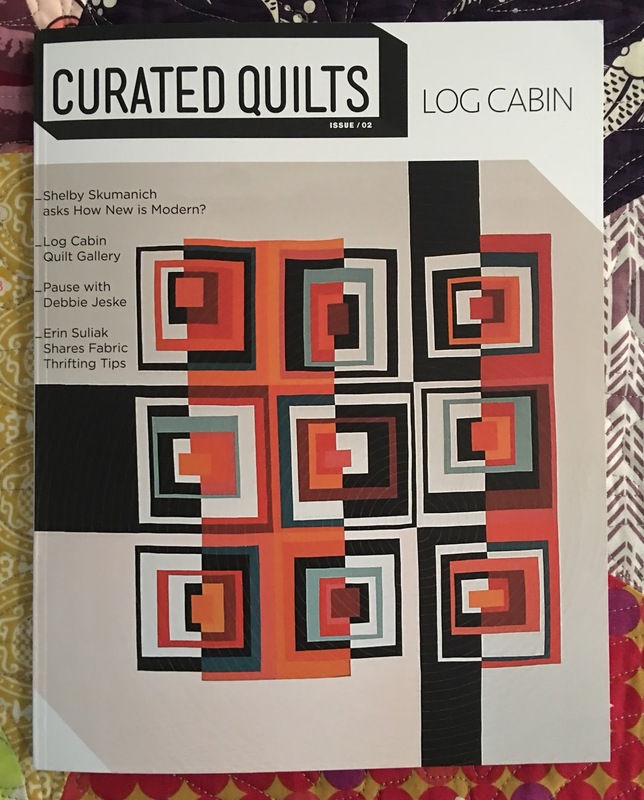 I am so thrilled to be a small part of the latest quarterly publication of Curated Quilts. It's real. Holding the beautifully weighted pages in my own two hands - oh, the feeling. The fact that I really love the mini, the creative journey involved in making it and that I have the honor of being included alongside so many makers that I admire is a bit overwhelming. Definitely check it out if you haven't already on their website HERE. Copies are shipping now and digital subscriptions available as well. Signing up for the newsletter also makes it easy to find out about future themes. 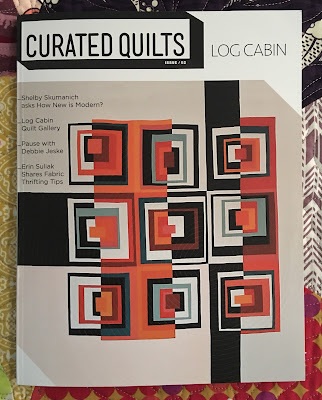 Next issue will be filled with Minimal quilts, a new found favorite style of mine. 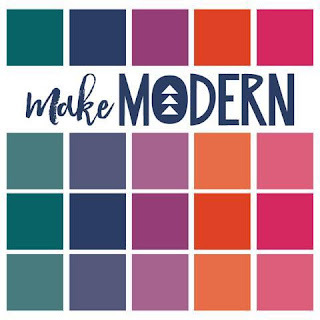 Creating with a given palette in a specific theme is right in my wheelhouse. I missed finishing the linear mini for the first publication (shared HERE) and there wasn't any way that was going to happen again. Working in a series and exploring the same shape seemed like a natural progression. 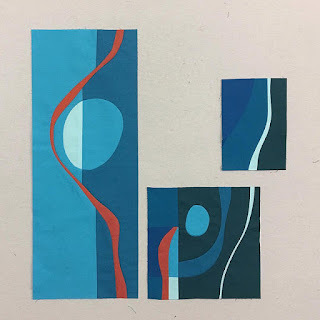 I had just finished teaching a "Improv Abstraction" workshop for the Bay Area Modern guild in September and was excited for the opportunity to explore how to translate it into a Log Cabin. Because of the a size restraint, I decided to make the curve more gently sloped and extend the straight tail as needed. The contrast of pieced parts on one side and mostly single parts on the other was one way to distinguish them. More obvious, is the high and low contrast of colors. Retaining a traditional, recognizable Log Cabin design was my goal. Having a consistent width throughout and keeping the arch similar was key. Trying to find the balance within the design layout while giving it a personal touch was challenging but ultimately rewarding. Those who know me have heard me describe my style as "perfectly imperfect' . 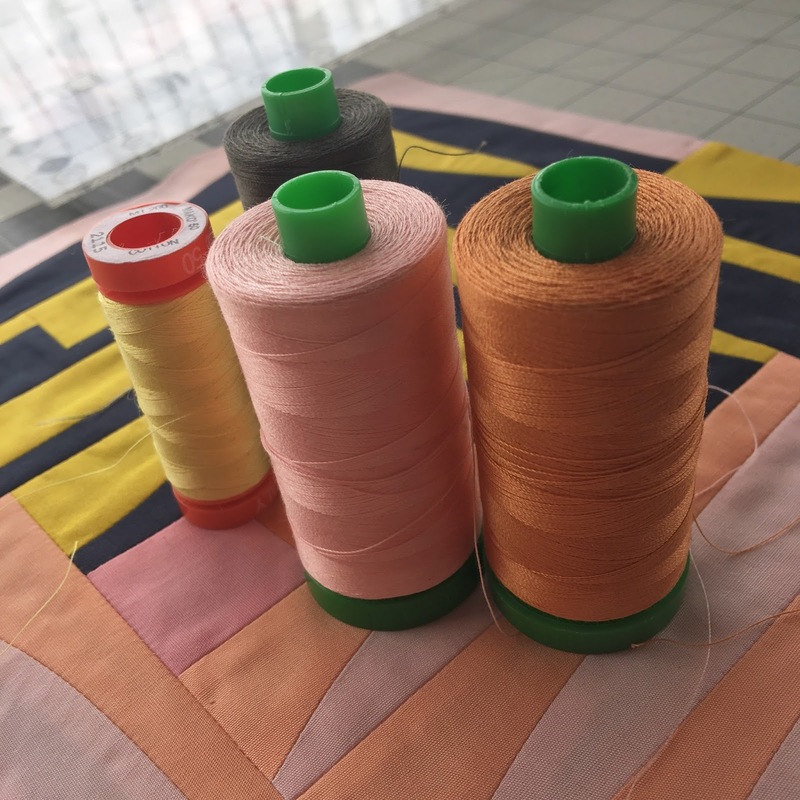 Sewing specifally for an entry that I hoped would be chosen brought with it a little more precision and yet I made sure to stay true to my aesthetics. Quilting on my domestic was kind of nice to tell the truth. 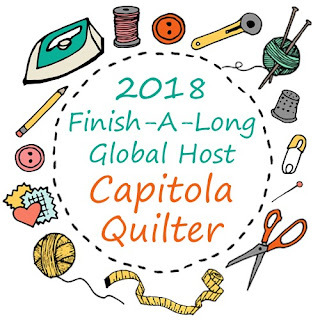 I've gotten so spoiled using my friends longarm I was nervous and a bit insecure when I began but quickly warmed up and enjoyed myself. In the end, I opted for texture rather than too many different thread colors to minimize the destruction from the design itself. 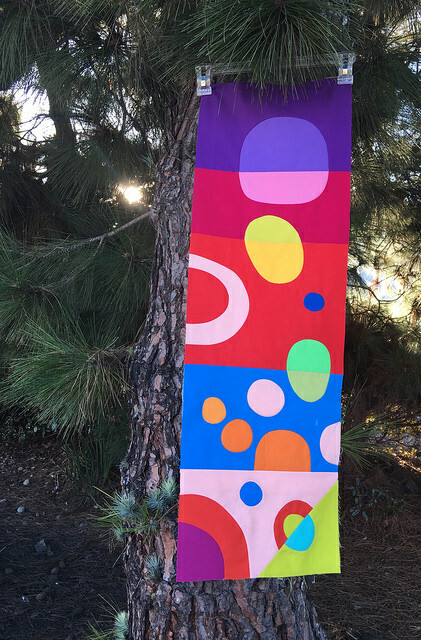 On the first side I went with somewhat random improv echo and the second side I kept intentionally minimal and controlled, stitching to outline the dark. Thank you Amy and Christine for the opportunity to show my work and to discover other makers in the process. 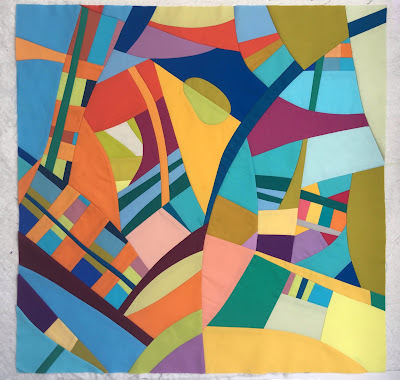 When I read the description for November's #BeeSewcial block : Maximalism, fun, happy, all color, no rules, no rulers proposed by Leanne @shecanquilt let's just say I was thrilled. "Time to laugh and play" how cool is that for prompt?! My scrap basket was a perfect place to pull shapes that were already partially cut into bits of inspiration as a starting point. I also dipped into my fat quarter stash to find the right color and larger pieces when needed. It was a weekend of scissors, freehand rotary and stitching with no pins. Definitely my kind of fun. I've worked this method enough to know not to get too attached to what I see mid-way on the design board. Things change and evolve as I sew parts together and I try to remind myself of that. Although it may look random, in the moment, when I'm in the zone, there are a ton of composition decisions being made. 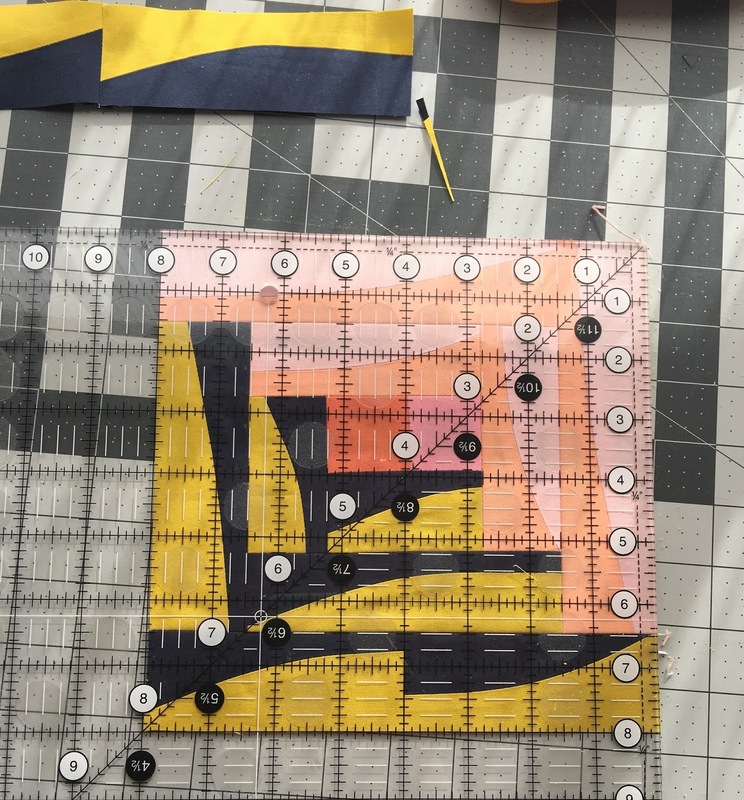 The photo above shows the the left and right quadrant on the design wall separated and the photo below showed them overlapped and pinned in place. With gentle curves I can get away with no pins which I prefer to help keep the momentum going but there are steps near the end where pinning in place to position the key visual "connections" is helpful. Excess is left until after I've sewn the joint as seen below in this underside process shot. The split egg shape has become a favorite thing to include and something I'd like to explore in a series. 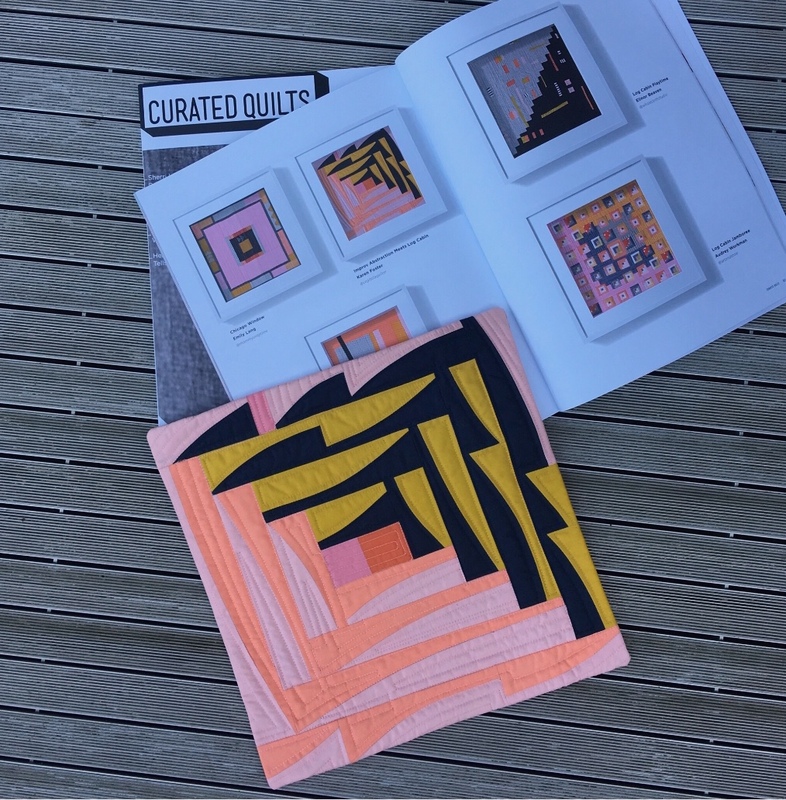 Here's a link to see the blocks Leanne has received from my other mates HERE. There is something so satisfying when they are all together and also a huge relief to see proof that it didn't get lost in the mail. 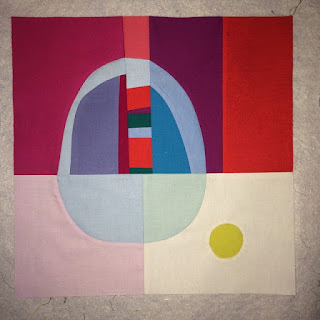 One of my fist BeeSewcial blocks and a design that I'd love to super size into a quilt is this one for Di. I think that subconsciously it sparked the "Reflections" theme that I chose when it was my turn back in 2015. Welcome! 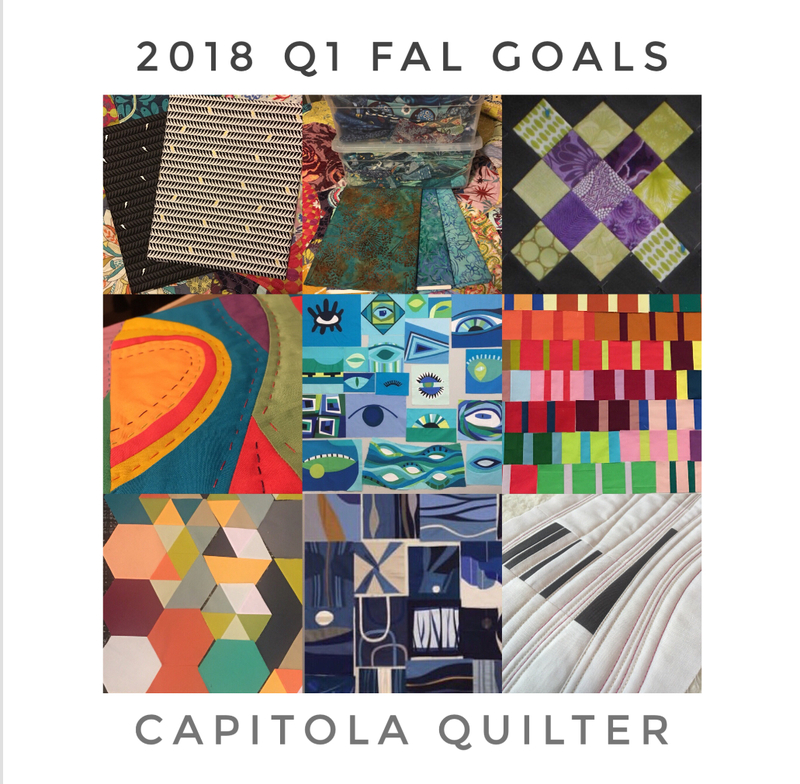 If you are looking to LINK UP your own 2018 Q1 FAL goals, go to THIS POST and scroll to find the blue "add your link" button at the bottom. Nine seems to be a good number if for no other reason that is how many fit conveniently in a mosaic grid. Last quarter I got 3 out of 9 done and I'll be happy if that's the case this time, especially if two are my BeeSewcial UFOs. 1. QuiltCon Mini Swap: I've pulled fabric with only a sneak here because although it's a two way swap (I make for her and she makes for me) the actual reveal won't happen until we meet in person in Pasadena on Saturday Feb 24th. 3. Ultra Violet Pantone Grannys: Using my granny swap blocks from way back in the Flickr days seems like a good multi-task but we will see how this one pans out as plans are loose. 4. 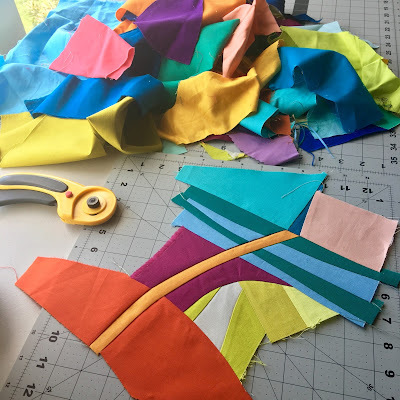 Big Stitch for Me: So I chose a favorite improv piece to use at the big stitch workshop recently to force me into making something out of it for myself. It is one step closer than sitting as a flimsy but still just stacked on the projects pile. 5. 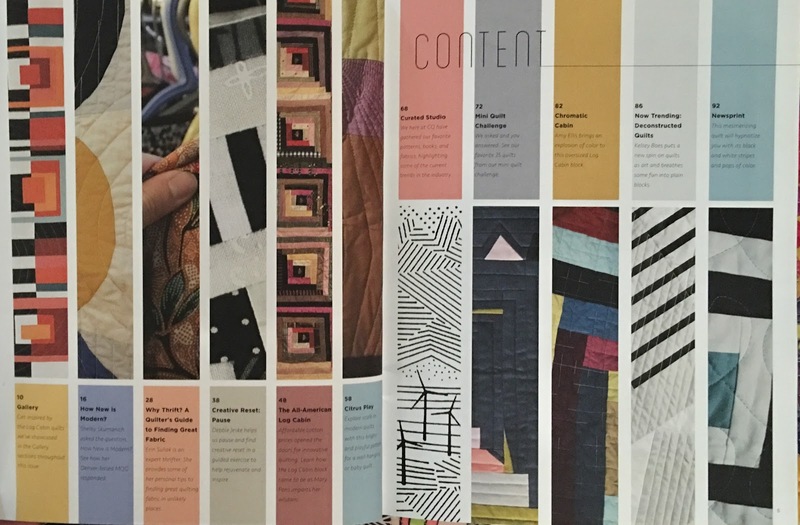 Eyes: These gorgeous BeeSewcial 2017 blocks have been staring at me begging to become the quilt they are meant to be. Top of the goals as I have come pretty close on the layout and love, love them. 6. 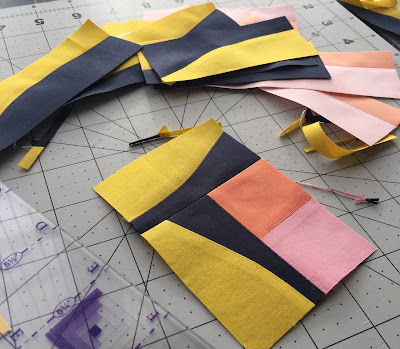 Color Workshop: I had so much fun at the Tara Faughnan class and was on a roll with many more strips already cut. No deadline or idea who this will be but I would enjoy myself spending time with this process so I put it on the list. 7. Weight of Love: When I had the chance to take a repeat workshop with Libs Elliott at PIQF in October I jumped on it. 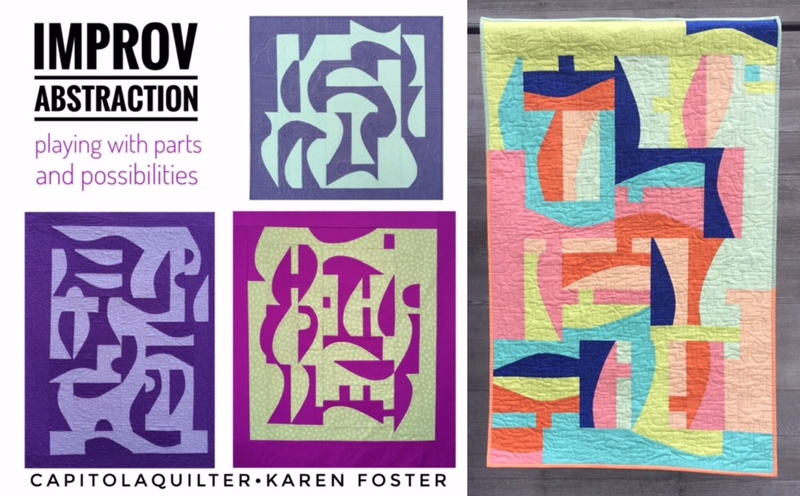 The parts from QuiltCon honestly don't look all that different so rather than having the UFO weigh on me, it's my goal to get it done. 8. 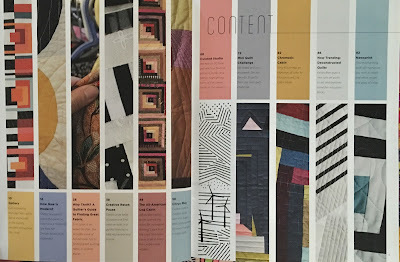 Stretch: Many of these BeeSewcial 2016 blocks were hand delivered to me in Pasadena at QuiltCon which clearly marks the passage of time since I'll be heading there in a few weeks two years later almost to the date. 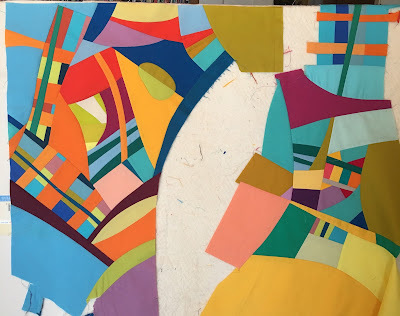 With a cohesive limited palette I thought the prompt would be easier to compose into a quilt but have been quite puzzled by the puzzling when attempted many times so far. No excuses. It's a tip top priority. 9. Minimalist Winter: Left overs and cut offs can often become something special in their own right. As I've mentioned before, I feel like a maximalist by nature and a minimalist by influence. Broadening my aesthetics is something I value and want to encourage of myself. I'm linking up my 2018 Finish-A-Long Q1 goals HERE and hope that you will to. Be sure to check out all of the details and deadlines for the new year ahead on the permanent FAL tab on my blog. All of the hosts are happy to hand hold to get you going. 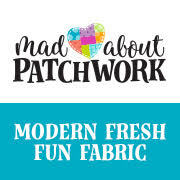 Like anything new there can be a learning curve with participating in a linky party so we are here to help!